For Model Year 2017, Polaris expands on the success of the Polaris GENERAL and answers the demands of consumers with a new benchmark in multi-passenger comfort: the Polaris GENERAL 4 1000 EPS. The launch of the new Polaris GENERAL 4 1000 EPS brings ultimate comfort and refinement to the multi-passenger market. This vehicle is perfect for the family who wants to play all day and work when they need to. The new Polaris GENERAL 4 1000 EPS has a 100-horsepower ProStar® 1000 engine, biggest payload, class-leading travel and ground clearance, a 600-lb. (272-kg) dump box and Electronic Power Steering (EPS)  with the addition of a second row of seats, with class-best knee clearance and shoulder room, to bring two more passengers along. Stay protected from weather and trail debris with standard half doors front and rear. They’re built with intuitive latches and great sealing to perform as flawlessly as the rest of the machine. They also swing open wide to make it easy to get in and out of Polaris GENERAL 4 all day. 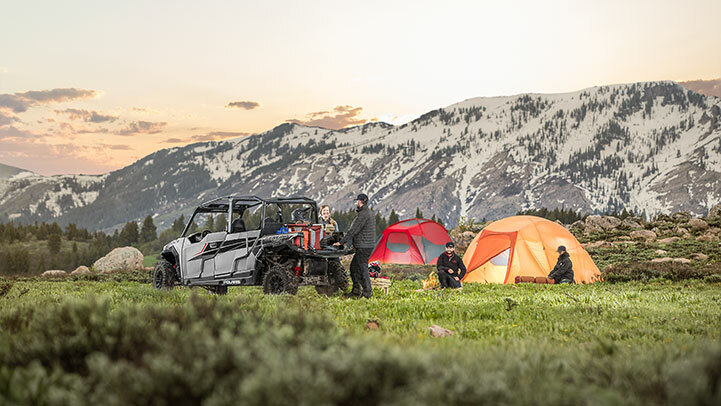 Polaris GENERAL 4 comes with all-new seats designed to keep you comfortable no matter where the ride takes you, from ripping trails to a day cutting wood. A wide seat base and supportive bolstering gives a secure cockpit to driver and riders and with standard cut and sewn seats. 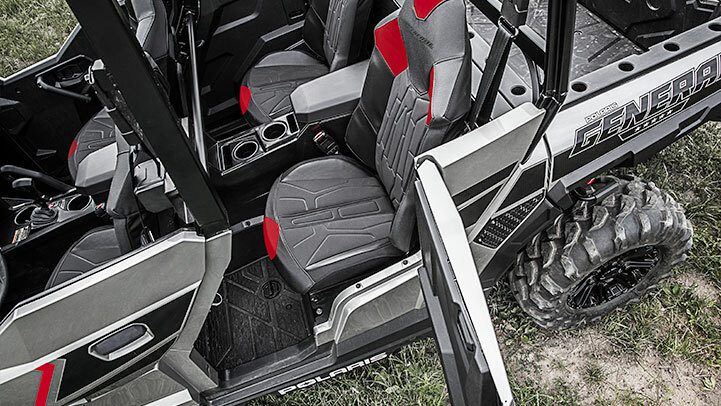 Driver seat comes standard with a seat slider to dial in operator ergonomics. Keep work and play essentials close at hand with a combination of in-dash storage and a class-best center console front and rear featuring a 12V outlet and 5.8L storage. 15L included in weather resistant bins under the front seats. Loaded down with gear for an extreme camping trip or ready to handle the toughest jobs, The Polaris GENERAL 4’s 1,280 lbs. total payload is up to the task. 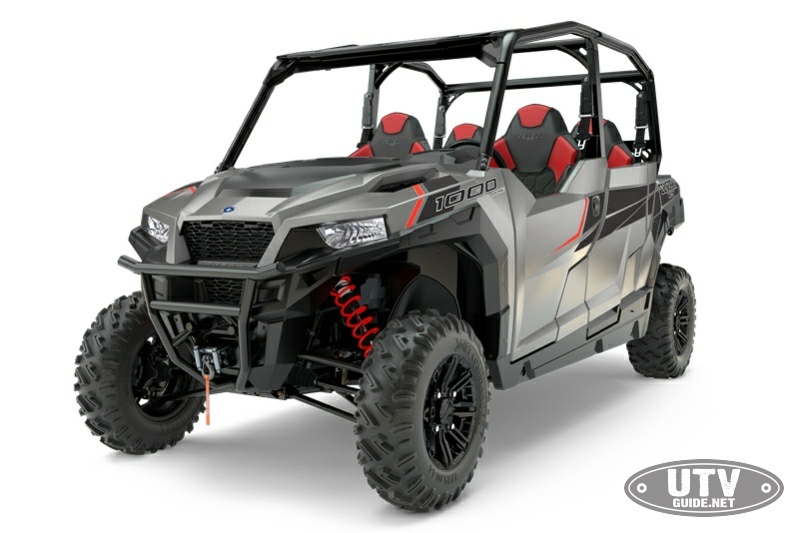 With the standard 2″ receiver, The Polaris GENERAL 4’s 1,500 lbs. towing capacity – aided with standard engine braking – is ready to tackle whatever your day demands. The Polaris GENERAL’s all-new cockpit was designed for the ultimate balance of work and play attitude for 4. 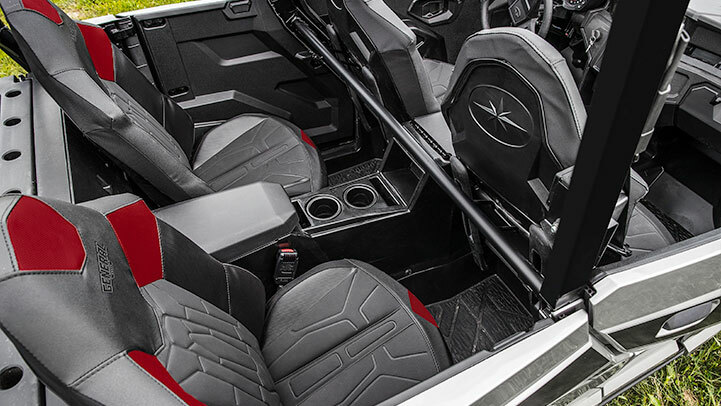 From the redesigned premium bucket seats that lock you in off-road, to the customizable instrumentation and easy cab access, the Polaris GENERAL 4 is the new standard in all-day comfort. GENERAL 4 doesn’t make the rear row riders an afterthought. The most elbow and knee room available from any competitor plus a full rear center console with 2 cup holders for a great time on the trail for all. 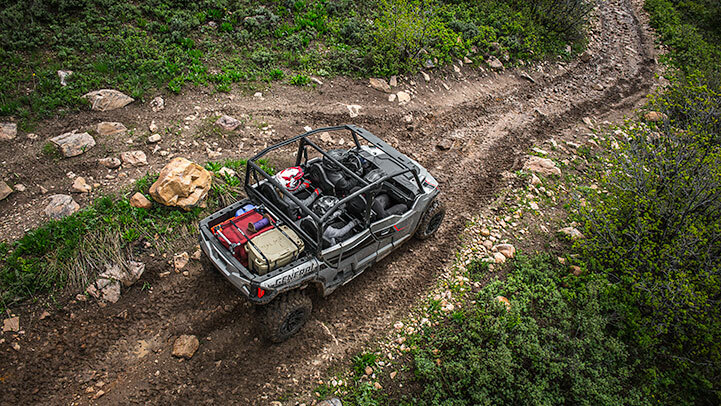 Stay protected from weather and trail debris with standard half doors front and rear. They’re built with automotive style latches and great sealing to perform as flawlessly as the rest of the machine. They also swing open wide to make it easy to get in and out of Polaris GENERAL 4 all day. Loaded down with gear for an extreme camping trip or ready to handle the toughest jobs, The Polaris GENERAL 4’s 1,280 lbs. total payload is up to the task. 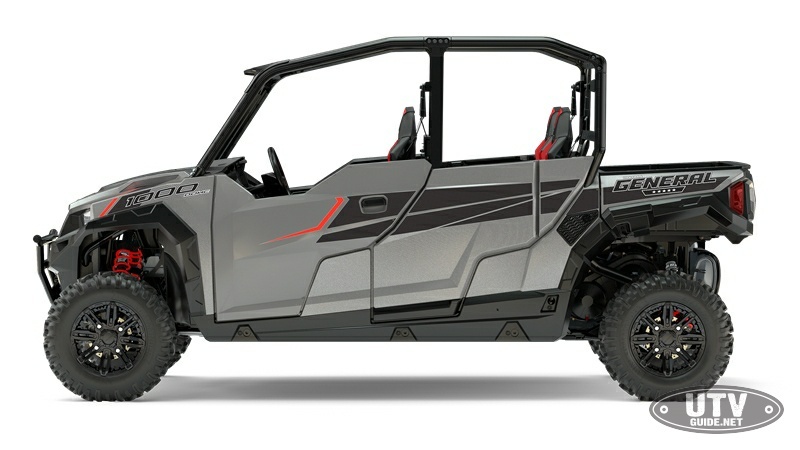 With the standard 2″ receiver, The Polaris GENERAL’s 1,500 lbs. towing capacity – aided with standard engine braking – is ready to tackle whatever your day demands. The all-new digital instrumentation cluster moves with the tilt adjustable steering wheel for maximum visibility. The combination of digital and analog gauge indicates vehicle speed, engine RPMs and standard trip information. The center digital gauge can be set up to just the way you want it, and even features an auto adjusting backlight that can switch from red to blue. 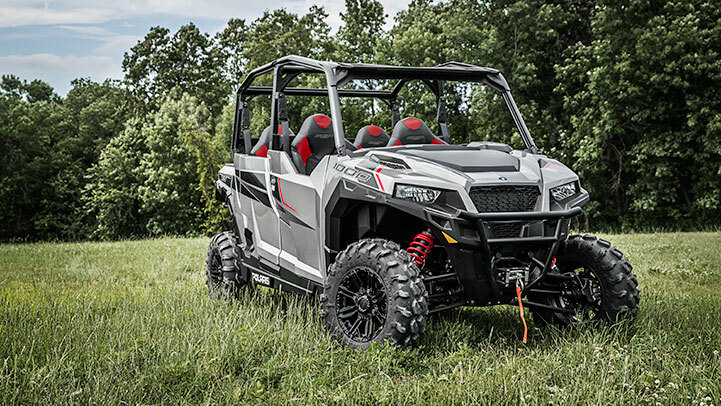 You get it ALL with The Polaris GENERAL. With sway bars front and rear, it stays planted and composed on the trail. The tuned suspension geometry featuring dual rate springs maintains 62% of its ground clearance when fully loaded down — 1.3 inches higher than Commander. No other machine gives you the suspension travel and 12 inches of ground clearance advantage like The Polaris GENERAL 4. 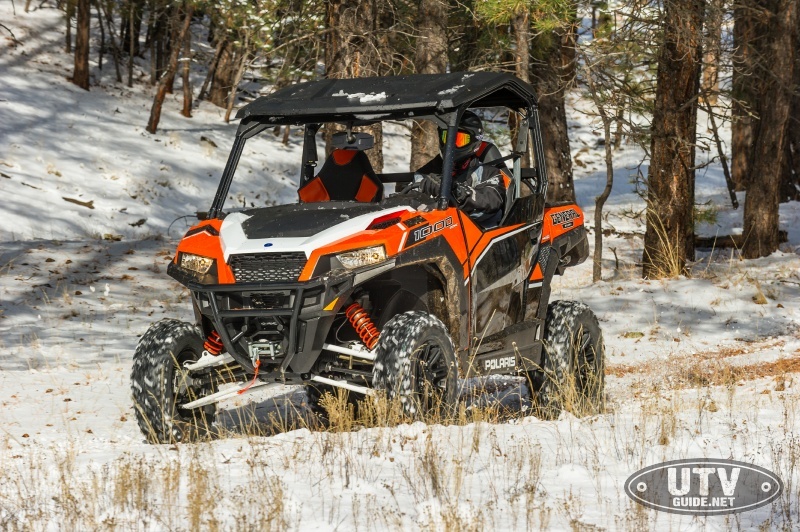 With 12.25″ of front and 13.2″ of rear suspension travel, The Polaris GENERAL is ready to clear whatever the trail or work site throws at it. 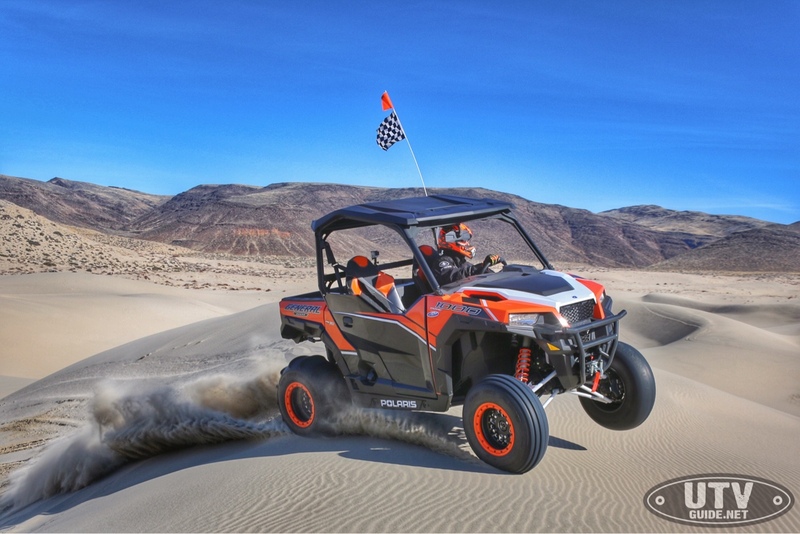 Polaris is a recognized leader in the powersports industry with annual 2014 sales of $4.5 billion. 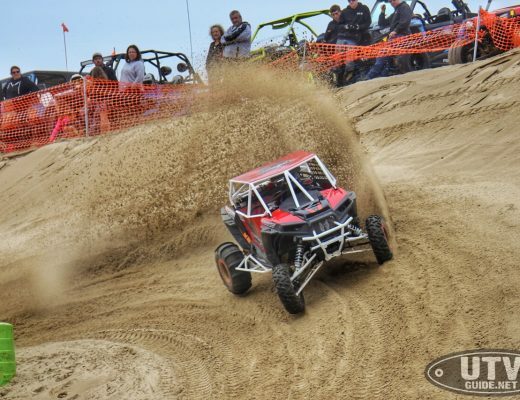 Polaris designs, engineers, manufactures and markets innovative, high quality off-road consumer and military vehicles, including all-terrain vehicles (ATVs) and the Polaris RANGER® and RZR® side-by-side vehicles, snowmobiles, motorcycles and on-road electric/hybrid powered vehicles. Polaris is among the global sales leaders for both snowmobiles and off-road vehicles and has established a presence in the heavyweight cruiser and touring motorcycle market with the Victory® and Indian Motorcycle® and Slingshot® brands. Additionally, Polaris continues to invest in the global Work and Transportation vehicle industry with Global Electric Motorcars (GEM), Goupil Industrie SA, Aixam Mega S.A.S., and internally developed vehicles. Polaris enhances the riding experience with a complete line of Polaris Engineered Parts, Accessories and Apparel, Klim branded apparel and ORV accessories under the Kolpin®, Cycle Country® and Pro Armor®brands.